East Yorkshire companies have rallied around to offer support worth tens of thousands of pounds to keep the legacy of a legendary Hull boxing club alive. 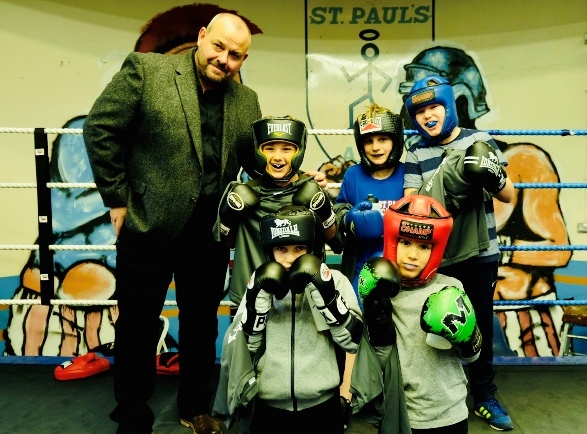 Founded in 1948, St Paul’s Boxing Academy, based in a gym on Church Side, next to Hull Minster in Hull city centre, has turned out champions of the sport including Olympic Gold Medallist Luke Campbell and Commonwealth lightweight title holder Tommy Coyle. Even more importantly, though, it has produced hundreds of ‘champions in life’, setting kids – including those with behavioural or learning disabilities, and from socially disadvantaged and troubled backgrounds – on the path to success in life. Yet, despite this huge contribution at the hands of hugely dedicated trainer Mike Bromby and his team of volunteers, the building St Paul’s inhabits has fallen into serious disrepair. So, he – and a committee of well-wishing local businesses, inspired by what his team have achieved – launched a major fundraising campaign in 2018, for cash to turn the historic gym into the kind of environment it deserves to be. And they have been overwhelmed by the number of people who’ve come forward to help in that transformational process. Now on the development committee and providing their time and expertise to the project free of charge are: John Rutherford, deputy chairman of the John Good & Sons shipping company; Alan Wood and Partners structural engineers; funding expert Darren Peacock of Peacock Finance, and Property development entrepreneurs Tony and Andrew Horncastle, who are also supporting with the building plans. Hull City Council, which owns the building, is providing significant support with the exterior re-roofing of the building and the gifting of the long-term peppercorn lease of the site. Also offering their support in a variety of ways are local firms including The Business Culture Hull, Andrew Jacksons’ solicitors, James Legal Solicitors, The Northern Foundry marketing agency and By Tracy Fletcher Limited PR, Garness Jones, MMS Ship Repair, Burstall’s Solicitors and Bambu. As a result of all their collective efforts, the club’s membership has shot up from 200 to 400 over the past two years. Peacock Finance has also recently donated brand new kit for students and trainers alike, including tracksuits, T-shirts and water bottles. Together, this group of influential partners are applying for St Paul’s – which relies on the dedication of 20 regular volunteers, including 14 coaches and a catering and cleaning team of six – to gain ‘charitable incorporated organisation’ status, to help secure its future through access to ongoing grant funding and fundraising. Their fundraising target for the initial, essential works and equipment is £300,000. This will pay for the complete refurbishment of the gym’s interior including new showers and changing rooms, a new kitchen, the refurbishment of the interior roof space to reveal the stunning vaulted ceiling space which is currently boarded over, new heating and the creation of a glass-fronted viewing area for boxing officials and parents watching the sporting activities. The St Paul’s team also want to invest in new IT facilities to enable them to, among other things, video and play back sparring sessions so that the competitors can learn how to perfect their technique. So far, they have raised £214,000 towards this grand total through donations, fundraising boxing dinners and grants from local charities including The Tribune Trust, Hull & East Riding Charitable Trust, the Matthew Good Foundation and Howden Rotary Club – as well as a substantial grant from Sport England. Their grand plan is to widen the reach of St Paul’s, including opening it up for other community groups to use, including schools like Aspire that cater for children with behavioural issues who can benefit from having a new outlet and interest. “I personally got involved because I was hugely inspired by the work of Mike Bromby and his team of trainers and could see he is the kind of guy who really gets how to make a difference to the youngsters that come through the gym,” said John Rutherford, who first met Mike at a Rotary Club presentation five years ago. “This place, and the work that’s done here, is just incredible and a real unsung gem nationally that forms an important bedrock of community in Hull. Darren Peacock, who has recently donated 300 matching T-shirts and water bottles to the club, as well as tracksuits for the trainers, added: “This place is just infectious and it’s impossible not to be inspired by the work being done at St Paul’s.